In a nutshell we ate very well in Bali. It was great not to have to cook at all. Our breakfasts were included as part of the hotel accommodation and in the first hotel we stayed in it was more varied than the second hotel with the mix of western and Asian food but by the end I was sick of trying to decide what to have. Generally I had an omelette from the egg station, some toast and something else like a pancake or a danish. So I ate a lot more for breakfasts than I usually do when at home. Unfortunately the coffee was awful and apparently the tea was weak in both our hotels. One morning I was standing at the toaster and two pieces came out that looked just like what I’d put in and when I asked a person nearby if they were his he got quite defensive about the fact that they were his and that there was plenty of food to go around you know. Ok, I was just making an observation, not trying to get into a fight or anything. Because we ate such big breakfasts we usually didn’t eat much for lunch or had quite a late lunch and then by dinner time we were ready to indulge again at a nearby restaurant. We had dinner one night at the hotel which was included in our package and it wasn’t very nice at all. It was a seafood buffet and the fish at these buffet’s was mostly overdone and not very tasty. Also, one of our party got Bali belly from a seafood salad he ate which was really unfortunate especially as it was on the last day and we had a 1am flight the next morning to come back home. There were a couple of standout meals. One was in a restaurant opposite our hotel in Tuban. We chose some fresh seafood from out the front and they cooked it on the grill before serving it to us. I had prawns, The Surfer had the best snapper I’ve ever tasted which would have been enough to feed two people and my friend had chili crab. It was absolutely delicious. The other standout meal was a Bumbu Bali near Nusa Dua. In retrospect we should have had the kids babysat so we could really enjoy the feast, the taste, the smells, the dancing and everything. But we didn’t. We still managed to enjoy ourselves once the kids settled down a bit. I liked that everytime a group walked in there would be a sing-song greeting ‘selamat malam’ which means good evening. While we were eating the music and dancing started which kept the kids occupied a bit too. The image at the top of this post was JJ’s and L’s food. By the time ours came I was ready to devour it, not take photos of it. It was so delicious and I’m glad we ate here towards the end of our stay because it would have tainted our experiences at other places. 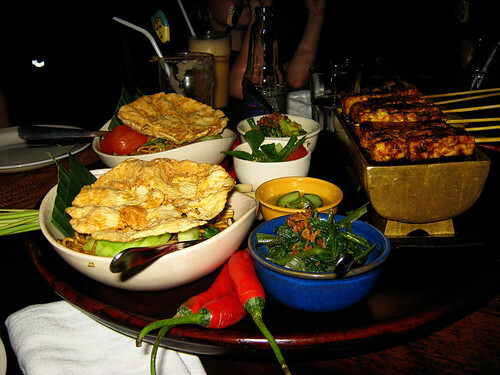 The meal was probably the most expensive we had in Bali but one that was definitely worth it. The photo above are the chefs at Bumbu Bali who aren’t hidden away in a kitchen. At restaurants I expected to have more Indonesian food choices but most restaurants tried to cater for all types of tastes so there’d be pizza, pasta etc, ie more western food. This was a bit disappointing although we did go to an Italian restaurant in our hotel where the food was absolutely delicious. I hadn’t been expecting that. 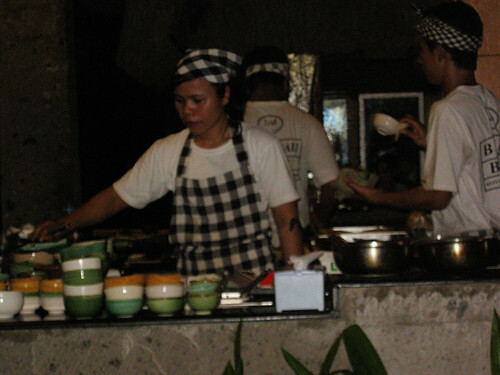 What I really really liked about eating out in Bali was the service. Because there were essentially two groups of us we could split the bill. That is one family ordered on one bill and we’d order on the other. We got used to saying right at the beginning that we were ordering for bill 1 and they were ordering for bill 2. It made paying at the end of the meal so much easier and because we were away for two weeks it saved us having to worry about meal IOUs. We already had to do that for transport and a couple of times when it got confusing I was able to organise the money so it all worked out. Usually money handling confounds me but I left my travel companions confounded a couple of times about what had just happened. I jokingly said I should become a money exchanger because some of them have quite dodgy practises (not that mine were). 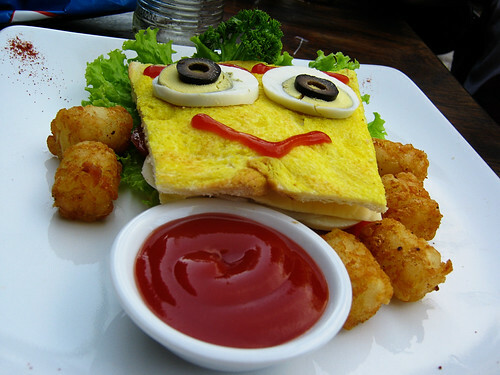 Most restaurants also had a kids menu and this was my favourite looking meal out of all of them. Guess who it is. Now I can’t have a food post in a foreign land without mentioning what happens to it at the other end. Don’t worry, I won’t go into graphic descriptions of Bali Belly. I didn’t get this at all. In fact it was the opposite. 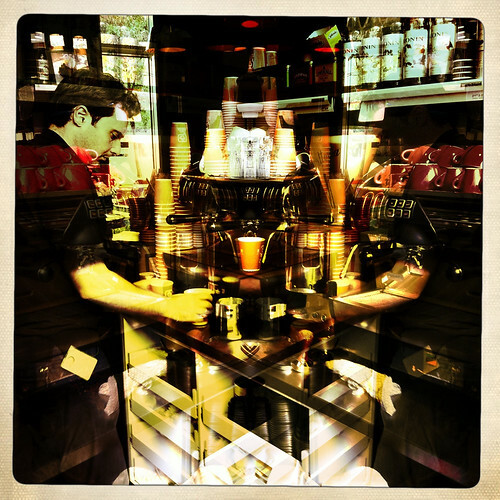 I’m usually very regular and to not be regular was a bit distressing and quite uncomfortable. I ended up buying a box of green tea bags because green tea helps me but even that didn’t really work. Towards the end of the two weeks I feel like I hardly ate at all because I felt so constantly full and that was really annoying. You’ll be pleased to know that I’m all back to normal again, and my stomach’s come down to it’s normal size. Apologies for ending on a more of a non-food note for this post but it’s all gotta end up somewhere! 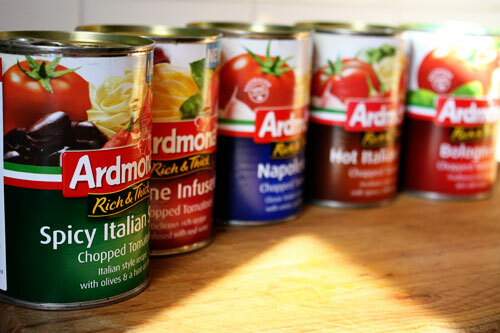 I was recently sent some canned tomatoes (SPC Ardmona) to try out. I use canned tomatoes all the time so thought I’d give them a go. I was also sent a recipe book and I cooked the Mushroom Bolognese Bake. These canned tomatoes are supposed to be rich and thick and I wanted to see if they really were. Some canned tomatoes I buy are more watery than tomatoey but these seemed to live up to their promise. Makes enough for 4-6 serves. Cook pasta in a large saucepan of boiling water according to packet directions. Drain and return to saucepan. Stir through cream, lemon rind and juice. Season to taste with pepper. Set aside. Heat oil in frying pan. 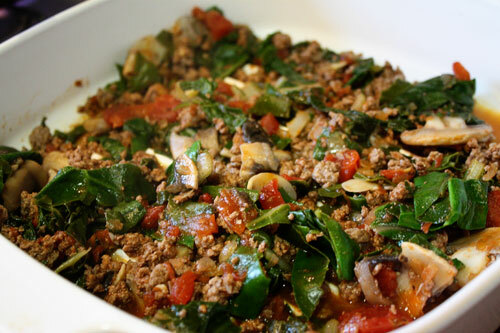 Brown mince for 3 minutes over high heat, stirring often to break up lumps. Stir in mushrooms, canned tomatoes and water. Return to the boil, cover and simmer for 8-10 minutes. Stir in silver beet. 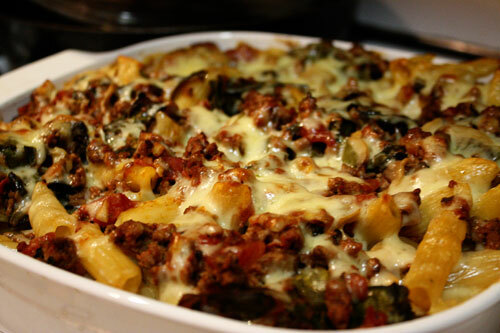 Spoon a layer of mushroom meat sauce into 8 cup casserole dish, top with pasta mixture and remaining sauce. Lightly toss together. Sprinkle with pine nuts (if using) and cheese. Cover with foil and bake for 25 minutes. Remove foil and bake further 5-10 minutes until cheese lightly browns. When eating this my son actually complimented me on the taste which he very rarely does this. For me, the lemon made all the difference as I’ve never used lemon with pasta before and it was gorgeous. I’ll definitely be cooking this one again. It was easy, delicious and big enough to last us for a few meals. We go to the local farmer’s market just about every Sunday morning to get our fresh produce and usually only spend as little time as possible there. However, there is a kids club that has different activities. 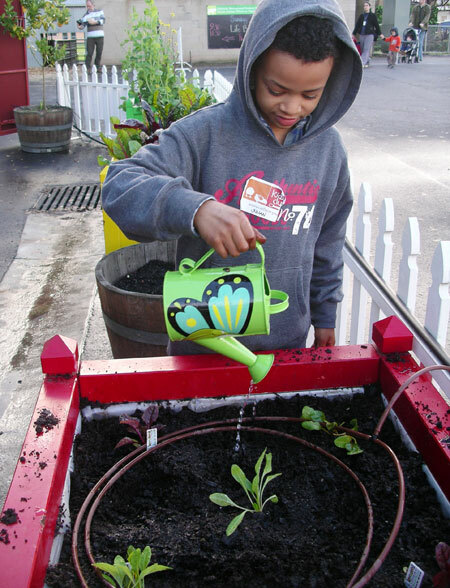 A couple of weeks ago JJ participated in the kids club doing the edible garden. The edible garden involved watering plants as you can see above, picking plants that were ready and then planing some new seedlings. JJ was happy with everything he was doing and looked interested so I was able to dash off and quickly do some of my shopping. Kid’s club usually involves eating food and this time they ate some very cute little round carrots they’d picked and drank some apple and carrot juice that a nearby market stall donated. We also got a bag of silverbeet and rainbow chard which I used in a stirfry. And all this for free. We don’t usually have the time to stay around for an extra hour but when we do, the kid’s club is a great activity and we’re very lucky to be able to participate. I would love to do more gardening but I don’t really have the room and I don’t really have the time. We grow herbs and that’s about it. My tomato crop from this summer was decimated by the extended heatwave we had so it was a waste of the water I used to try and keep them alive. We do have a local community garden and I’d like to get a plot there one day when I’ve got more time. One day. 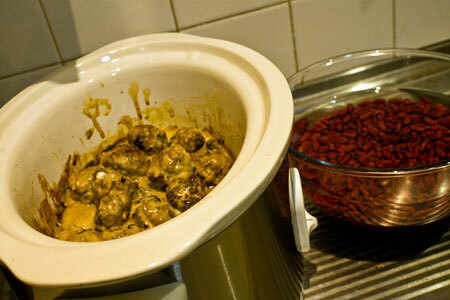 When I posted the slow cooker mushroom meatballs recipe I mentioned my bean mix recipe. As I was typing I wondered if anyone would want to know it and at least one person does so I’m sharing it. It’s also slow cooker week over at BlogHer so it’s kind of timely. I used to do my bean mix in a saucepan on the stove top but because I do a large bean mix it nearly always burned on the bottom of the saucepan giving my kitchen that awful burning food smell and then I’d have to be careful to not mix up the good bits with the burned bits. Using the slow cooker to do this, however, doesn’t give me those burned bits and I can cook that bit extra in one go, therefore saving me time. The slow cooker for me is ultimately about saving time. Onto my bean mix recipe. It’s my own, adapted from vegetarian friends who have made me nachos in the past. You could also use this for tacos or anything Mexican that requires beans. I’ve got a 4.5 litre capacity slow cooker and this recipe pretty much fills it up. I buy a kilo pack of red kidney beans – I like the Siena ones as they tend to keep their red colour the best. Soak half of them (500g) overnight in lots of water, drain, rinse and put them in a saucepan with new water to boil up. I boil them for around 40 minutes but it doesn’t hurt to do it longer so long as you have enough hot water. You could do this step in the slow cooker too I guess but I don’t. Once they’re cooked, drain again, rinse and leave in the drainer. Heat up the olive oil in a frypan and add the onions and capsicum and saute them until the onion is soft. Add the garlic and mushrooms if you’re using mushrooms and cook for a minute. Add the chilli and cumin and stir them in for a minute. In the slow cooker add the beans and the canned tomatoes and the tomato paste if you’re using it (I’ve found with the Siena beans and the slow cooker I don’t really need tomato paste). Then add the onions etc you’ve cooked in the frypan. Mix everything up with a wooden spoon and cook for 2-4 hours on High, or 6-8 hours on Low. If it’s too watery from the tomatoes, just lift the lid off at the end so some of it can evaporate. Now, you could eat it like this with your nachos or tacos but I like it all blended and doing that also hides the capsicum from those fussy eaters. If you want them blended just use a hand held blender, or put the mixture into a food processor. This is enough for one huge meal or put it into containers to freeze. Excuse me not taking any pictures here but I’ve been sick since Saturday so I left half my brain somewhere – probably the somewhere that didn’t tell met that I didn’t button up my cardigan properly this morning before I took my son to school. 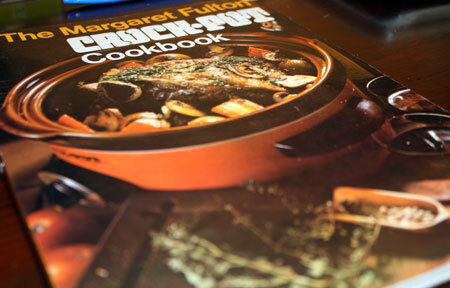 I recently wrote about my slow cooker and the Margaret Fulton crock pot cookbook. Yesterday I cooked the mushroom meatballs from her crock pot recipe book and despite my trepidation they turned out quite well. I wasn’t sure about the canned mushrooms as they looked very unappetising. You can see in the photo that I’ve got my red kidney beans soaking so that I can make a bean mix that I use for nachos and/or tacos. Soaking half a kilo of red kidney beans will eventually give me enough bean mix for four-five lots of nachos for the two of us. Now that I have the slow cooker I cook the bean mix in it because it nearly always used to burn when I did it on the stove top but I don’t have that problem with the slow cooker. See why I love it? Combine all ingredients for gravy except sour cream in crock pot; stir thoroughly. Mix all ingredients for meat balls. Shape into walnut size and brown in frypan. Add meat balls to gravy mixture in crock pot, cover and cook on Low setting for 6 to 8 hours, or High 2 to 4 hours. Fifteen minutes before serving, stir in sour cream, reheat on High. Serve with noodles or boiled rice. We also ate with some steamed broccoli as it doesn’t seem right to have a meal without vegetables. It turned out quite well and will do us for a couple of meals and I’ll put the rest into the freezer for another meal. When I was growing up in the 70s many of my meals were done in the crockpot (done by mum that is). Now, about 30 years later slow cookers (as they are called now) are making a comeback here and I’m a convert. A few people I know have bought slow cookers and swear by them. I sort of listened to them and wondered what all the fuss was about and gradually all the talk started sinking in. It sank in so much that I finally went and bought one with a voucher I had from Christmas. I have certainly got my money’s worth out of it by using it at least once a week and I love it. The main thing I love about it is that once all the ingredients are in the cooker you don’t have to do anything. When I’ve cooked large meals in a saucepan, for instance, I’ve had trouble with some of it sticking to the bottom of the pan but with the slow cooker this doesn’t happen. It’s an absolute breeze to clean. The other thing I love about it is that I have enough food in it to feed us a few meals so my freezer always has leftovers. I love it so much I must have told nearly anyone who’ll listen about it. I now have evidence that my talking about my slow cooker has sunk into at least one person because she presented me with Margaret Fulton’s Crockpot cookbook this week. She knows I’m into op-shopping and she also knows I’m into my slow cooker and this book was from the op-shop. For the non-Australian readers, Margaret Fulton is fairly well known here for her recipe books and in fact I have another of hers I found second hand that’s an encyclopedia of food and cookery and has lots of those basic recipes that most recipe books don’t have. It’s got some fascinating recipes in there. One these recipes I wouldn’t eat if I was desperate the Pressed ox tongue. No thanks. The great thing about the book is that it talks about adapting your favourite recipes for the crockpot or slow cooker, and did you know that you can cook cakes in a crockpot? Neither did I. I’ve got some experimenting to do thanks to Margaret Fulton and my colleague.